Health Minister Dr. Rajitha Senaratne lays the foundation stone for the new factory. 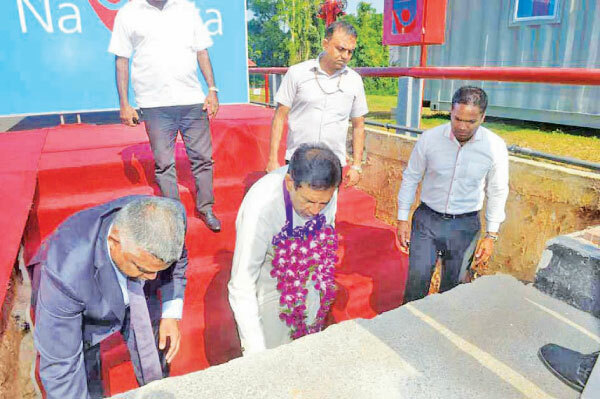 Health, Nutrition and Indigenous Medicine Minister Dr. Rajitha Senaratne recently laid the foundation stone for the 11th drug manufacturing factory to be built in Sri Lanka. This is the second drug manufacturing factory to be set up by Navesta Pharmaceuticals and it will provide employment for 60 youth. The cost of the project is Rs. 800 million. The second factory is to be set up at Millaniya, Horana. The company’s first factory provided employment to 140 youth and manufactures 12 varieties of antibiotics. The drugs are supplied to the Medical Supplies Division of the Health Ministry. Up to now, 36 companies have signed agreements with the State Pharmaceuticals Corporation (SPC) to manufacture drugs in Sri Lanka. The country expects to produce 85 percent of its drug requirement locally, by 2020.